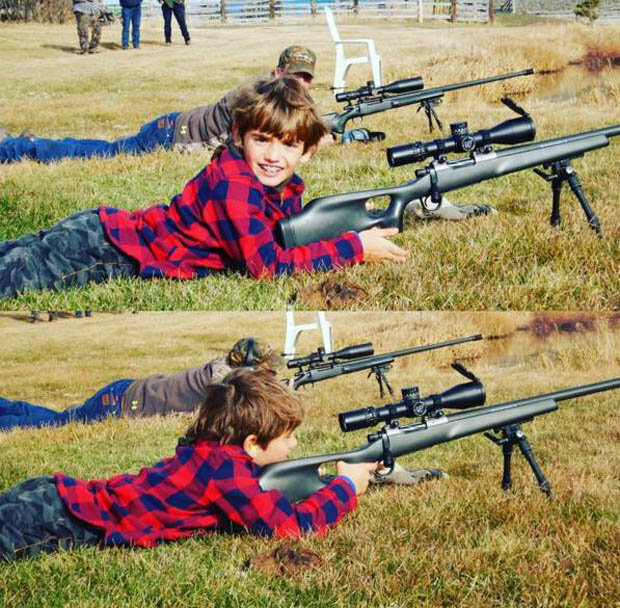 The gun haters and freedom-phobics of social media recently ganged up on President-elect Donald Trump’s seven-year-old grandson over a series of Instagram photos. Trump’s son, Donald Trump Jr., had the nerve to take the boy rifle shooting in Montana—in what he called an “awesome and much-needed father-son trip”—and later post photos of their outing on the social media site, the UK’s Daily Star reports. One social media scold said, “Terrible to teach a CHILD how to shoot.” Another fretted that doing so was “teaching the next generation to be violent!” Maybe they should talk to teachers and child development experts, who agree that teaching young people to shoot is one of the best ways to demystify firearms and to emphasize the importance of safety, discipline and self-confidence. “Deeply saddened by the senseless act of gun violence at Ohio State this morning.” That’s Hillary Clinton’s running mate, Sen. Tim Kaine of Virginia, tweeting after 11 Ohio State students were attacked with a car and a knife. Vox: “Ohio State University shooting; what we know,” accompanied by 18 pre-prepared gun violence charts. Mistakes are to be expected from those whose playbook encourages them to rush to the microphones after a tragedy. But apologies? Let’s just say we aren’t holding our breath. Yesterday we reported that many gun stores across the nation saw a large turnout on Black Friday. Several owners and employees noted that the crowds seemed even larger than last year’s, but without any sort of official tally, no one could be sure. Until, that is, the FBI released the data on the number of NICS checks conducted on November 25. As it turned out, the number of Black Friday background checks conducted this year totaled 185,713—surpassing 2015’s record-breaking total by almost 400. In other words, despite the Grinch-like predictions from the “mainstream” media, more guns were sold on Black Friday 2016 than on any previous Black Friday on record. And while data for the entire month of November won’t be available until tomorrow, it’s looking like the penultimate month of 2016 could set a record all its own. We’ll keep you posted. The U.S. Marines have been undergoing a series of experiments that utilize suppressors on all of their weapons—everything from M4 rifles to .50-caliber machine guns. The tests have been conducted by the Bravo Company, 1st Battalion, 2nd Marines. "What we've found so far is it revolutionizes the way we fight," noted Maj. Gen. John Love. "It used to be a squad would be dispersed out over maybe 100 yards, so the squad leader couldn't really communicate with the members at the far end because of all the noise of the weapons. Now they can actually just communicate, and be able to command and control and effectively direct those fires." As the military units conduct training and exercises over the next year and a half, the Marine Corps Warfighting Lab will be gathering and analyzing the data. Chief Warrant Officer 5 Christian Wade is expecting successful results. "When I show how much overmatch we gain … it will have sold itself," he said. In the wake of a shooting that saw a 14-year-old kill a six-year-old on elementary school grounds, a South Carolina lawmaker is proposing legislation allowing teachers to carry on campus to prevent similar shootings. While opponents of the measure say school resource officers are enough to handle future shootings, Putnam argues most institutions—especially rural schools—do not have SROs, and arming teachers is a quick, efficient solution that could prevent further tragedy. When two armed men walked into a store in the West Ridge section of northern Chicago shortly before 1:00 a.m. Monday morning and announced a robbery, a 21-year-old store employee—who was also a Right-to-Carry permit holder—shot both of them, sending them to the hospital and then to jail, police told DNAInfo.com. One robber, an 18-year-old, was shot in the right forearm, and the other, who is 20, was shot in the right shoulder. A third man, who was unharmed, was arrested in connection with the incident, police said. The store employee sustained minor injuries in the confrontation, for which he was treated at the scene. About 15 minutes earlier, less than two miles away, two armed men attempted to rob a pair of women, but when the women said they had no cash, one of the men started shooting, striking a 23-year-old woman in her right foot and a 28-year-old women in her left leg. Police are still working to determine whether the two robberies are connected.